Part of this year’s State of Design Festival, Look.Stop.Shop is a series of retail installations scattered through Melbourne’s CBD. The project is a self-guided trail through the city streets and laneways, with installations in the windows of small boutique shops, department stores and showrooms interpreting this year’s theme, Design that Moves. Participating retailers range from bookshops and stationers to shoe shops and jewellers, via galleries, lighting showrooms and design stores. This weekend we did the grand tour of all 29 venues that make up the 2011 trail in order to pick our top ten installations. 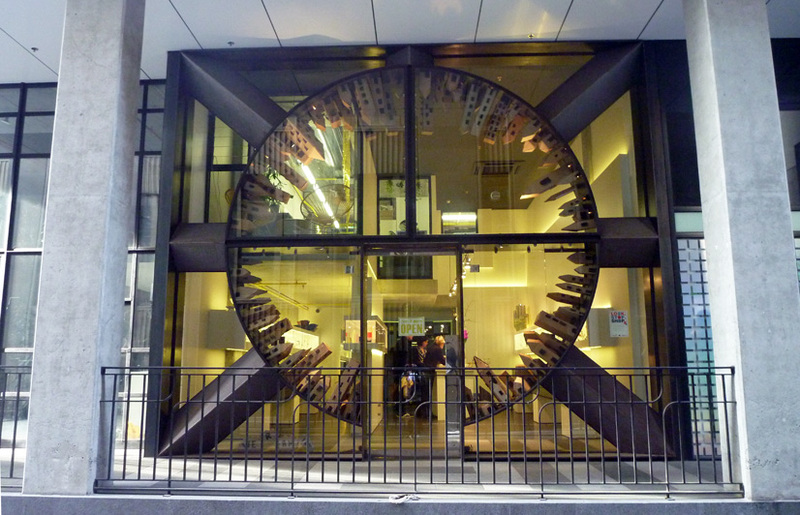 The already striking façade of the Pieces of Eight Gallery on Russell Place has been transformed with a series of cardboard buildings that climb the circular form of the shop front. Called ‘We Are Family’ and created by Luca Lana, the installation features child-like depictions of different types of buildings that are brought together in this inverted world. ‘Overflow’ is an installation of lanterns that spill out from Geyer’s sixth floor studio above the bustling city laneway, Centre Place. The lanterns represent a collection of imagination bubbles that overflow from Geyer’s studio, allowing the studio’s ideas to be shared and regenerated with the city and its inhabitants. This year, the window of the Design Dispensary has been enlivened by a lighthearted installation created by a team of RMIT Visual Merchandising students. A string of hot air balloons are suspended in the window, with a series of cut outs referencing the cover designs of the Crumpled City Maps on sale in the shop for global cities including Berlin, Sydney, Rome, Paris and London. Just outside the entrance to Akira in the GPO, this installation by artist Dana Harris is a simple, understated display that complements the stripped back retail space of the store. Harris has created an installation of coloured threads spun around cotton reels that references fashion designer Akira Isogawa’s use of colour in his fashion collections. Gloss Creative’s installation in the Sportsgirl shopfront, called ‘My Moving Image’, reflects the constant movement of the street outside and the shoppers within. With a series of mirrors at the entrance, the installation explores the individual style expressions of passers by. Hill of Content’s installation, ‘Moving Stories’ by Illustrators Australia, features a series of animated dioramas – miniature theatre sets that encase digital screens, offering viewers a digital interpretation of traditional story telling. ‘Apparent Motion’ is a collection of gentlemen’s jewellery that explores the idea of kinetic jewellery, including a number of rings and cufflinks crafted from old New York subway tokens. The pieces have been created by eight jewellers: Beth Croce, Cath Da Costa, Tamara Hain, Deeana Michela, David Parker, Ellen Pittman, Fiona Griffiths and Justin Siow. A whimsical and slightly mad construction fills the window of Obus on Flinders Lane. A series of bike wheels have been studded with brightly coloured shoes from Melissa Shoes in an installation that embraces art, design and technology. A three-metre tall tree structure is the centrepiece of the Jurlique store for the Look. Stop, Shop installation. Adorned with glass bottles, the tree is blooming with citrus, sage, lavender, rosemary and geraniums. Jeweller Cinnamon Lee’s collection, Covert Jewels, is a series of introverted designs that both reveal and conceal. The intricate detailing of each piece is hidden on the inside of the ring, keeping the unique personality of the design concealed from the viewer. Lee has used high-resolution 3D printing with precious metal casting to produce the collection. I like seeing what some of the bigger retailers do to engage with the festival audience. it’s important nit to be cynical when incorporating them into a city self guided tour. Thanks for the kind recognition our our exhibition display as it was the first exhibition in our new store.